From location to accommodation, The Lodge at Sonoma Renaissance Resort & Spa provides a chic retreat amid California's breathtaking wine country. 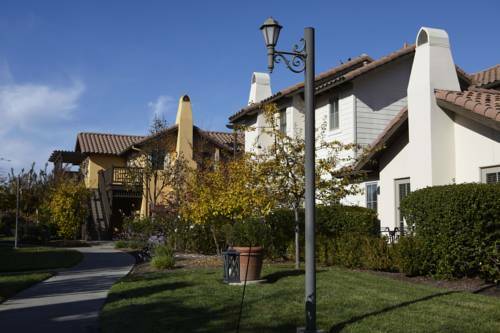 Situated within walking distance of the quaint shops and world-class restaurants of Sonoma Plaza, our hotel offers rustic-chic guest rooms and suites, appointed with plush bedding, high-speed Wi-Fi and flat-screen televisions. Enhance your experience in a cottage accommodation, featuring expansive sitting areas with private fireplaces. Enjoy resort-style amenities, including a modern gym with yoga classes and heated outdoor pool. Savor distinctive cuisine at our award-winning restaurants, and pamper yourself with massage, beauty and wellness therapies at our hotel spa. Succeed and celebrate in versatile event spaces, including elegant wedding venues and a picturesque outdoor patio. With spacious hotel accommodations and modern amenities, Sonoma Renaissance Resort & Spa is a comforting haven where you can work, relax and recharge. Carneros Bistro: Savor hearty American cuisine spiced with a Mediterranean flair at Carneros Bistro, our Sonoma resort's award-winning fine dining restaurant. The Bistro complements its farm-to-table fare with an impressively tempting wine list. Bean & Bottle - Check out the Wine Shop: Bean & Bottle combines an inviting coffee shop with a modern wine bar. Begin your morning with a rich cup of coffee and celebrate a day of touring Sonoma County with a glass of fine wine. Sweet treats and unique cheese options are also on hand to tempt. Poolside Menu & Service: Sit poolside and enjoy a range of light dining options from the resort's restaurant. It's the perfect way to enjoy sandwiches, salads and other tasty fare while relaxing in the Sonoma sun. Site of Haraszthy Villa " Father of Calif. Viticulture"